President Donald Trump routinely threatens to tear up trade ties with Mexico. So Mexico is building backup plans this year. It's doubling down on free trade and turning toward allies in Latin America, who are also changing their own tune on trade. Videgaray can't say the same about Trump being in agreement on trade. Round 3 of NAFTA negotiations between the U.S., Canada and Mexico, begin Saturday and major issues remain unresolved. Some see the alliance as a key part of Mexico's backup plan if Trump withdraws from NAFTA. "The Pacific Alliance is a new frontier that's going to move forward with or without the United States," says Sergio Guzman, an analyst at Control Risks, a global consulting firm. 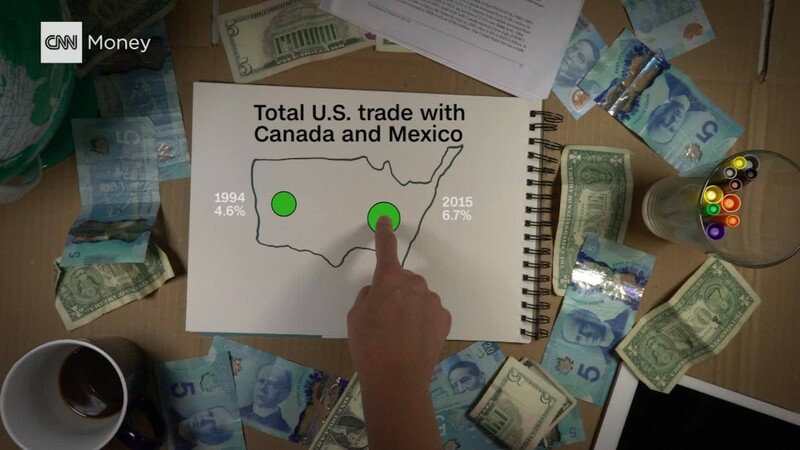 "Countries are seeing the U.S., not just rhetorically but because of NAFTA, as less and less of a dependent partner." The Pacific Alliance represents a shift for Latin America, a region historically shuttered to global trade. Latin American countries are now going in the opposite direction, eliminating tariffs and opening up economies. Mexican officials traveled earlier this year to Brazil and Argentina to begin talks on potentially buying more corn and soy -- two products that Mexico buys almost entirely from the United States. Mexico is also in trade talks with the EU and it has flirted the idea of a free trade agreement with China. Brazil is leading negotiations with the European Union to strike a deal in principal with the South American trade bloc known as Mercosur. 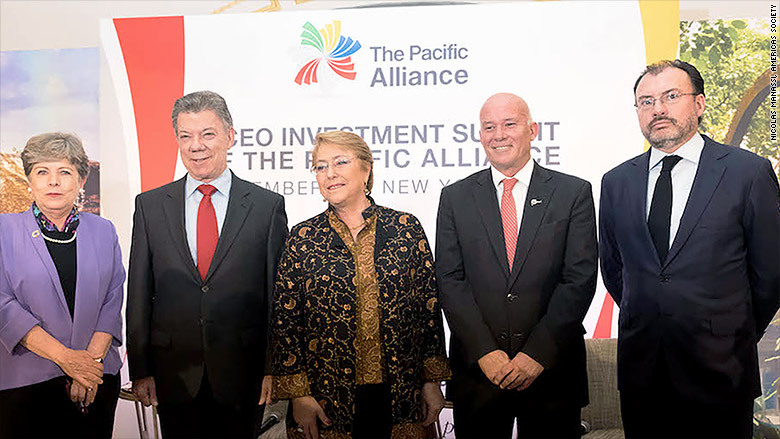 From left: Alicia Barcena, head of CELAC, President Juan Manuel Santos of Colombia, President Michelle Bachelet of Chile, Peruvian trade minister Eduardo Ferreyros and Mexican foreign minister Luis Videgaray. Argentina, a Mercosur member, knows the dangers of tariffs and protectionism. With trade barriers on almost everything for years, Argentina was once the most expensive place in the world to buy an iPhone. President Mauricio Macri, who came into office in 2015, ended tariffs on computers, tablets and other electronics this year. The results: Computer prices in Argentina dropped 30% in July from a year ago and sales shot up 70%, according to Argentina's production minister. Argentina also came out of recession this year. Michelle Bachelet, Chile's President, threw in a subtle jab at Trump in her closing remarks on Wednesday at an event hosted by the Council on the Americas, a business organization. In January, Trump withdrew from the Trans-Pacific Partnership, a trade deal that hadn't gone into effect but that Chile, Mexico and Peru had agreed to. Bachelet said TPP isn't dead. Its nations are moving on without Trump. "It's impossible to think of TPP as it was with the United States," Bachelet said. But, after highlighting upcoming meetings with remaining TPP nations, she added: "What's going to happen to TPP? In other words, a new kind of TPP?...this is a story in progress."